From public land managers to homeowners and everything in between, our clients are the lifeblood of our company. Please feel free to request more specific contact information so that you can ask our clients about their past experiences with us directly, or check out our testimonials page. Trail Dynamics is proud to have completed trail projects for every Federal land management agency as well as state agencies around the Southeastern United States and the country, and many county and municipality managed lands. Our staff has done trail work or provided other trail related services in over 20 states and 3 foriegn countries (and counting). We are familiar with government procurement processes as well as NEPA and other public land preservation requirements. We derive a special satisfaction from knowing that these trails are available for everyone to enjoy, and that they will be preserved for future generations. View the Project Plan for Wolf Branch Trail in Bent Creek. View the Hungry Mother State Park Trail Plan. Recreational trails have become an extremely desirable (and sell-able!) amenity for gated communities and other high end housing developments, and Trail Dynamics' services are highly sought after in this market. Trail construction and maintenance costs are a tiny fraction of the costs of more traditional planned community amenities such as golf courses or country clubs, have substantially lower impacts on the land, and are more and more in demand by an increasingly health conscious and outdoors oriented society. We can work with your landscape architects and sales force to identify, design, construct and maintain a trail system that works for your community, delights your residents, and acts as a strong sales tool to entice your potential customers. 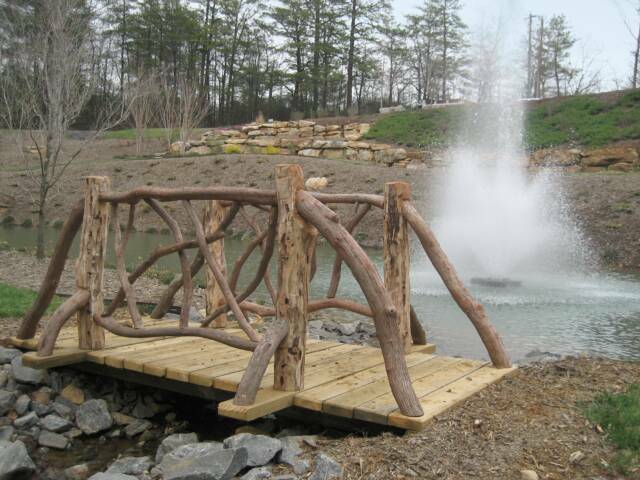 View photos of Shoals Falls in our Project Gallery. View photos of Pinnacle Falls in our Project Gallery. View the Pinnacle Falls Trail Plan. View photos of The Settings in our Project Gallery. View photos of Sims Valley in our Project Gallery. View photos of Southcliff in our Project Gallery. View photos of Sylvan Habitat in our Project Gallery. View photos of Tuckaseegee in our Project Gallery. Frequently non-profit organizations are an important part of the equation for trail projects on public lands or lands within conservation easements. Trail Dynamics has immense respect for the work these organizations do to make land accessible to responsible recreational use while preserving fragile environmental balances. We are North Carolina certified clear water contractors and, both as a company and as individual staff members, have donated funds and sweat equity to numerous trail related volunteer efforts through the years. Trail Dynamics believes in bringing the trails to the people. While we all enjoy remote wilderness settings when we can get to them, the trail systems where we spend more time are in many ways more important. When these trails are located within reach of our children attending school or our loved ones recuperating from illness or accident, they are even more valuable. Trail Dynamics takes the needs of your students, patients, staff, and community into account when designing these heavily used trail systems, whether those needs include exercise, disabled access, a lunch break escape from the office, or a competitive trail for your cross country team. View the Trail Assessment and Management Plan. View the Furman Trail Plan. In this era of increasingly popular ecotourism, health consciousness, and outdoor recreation, what better way to attract customers to your resort than with a well designed trail system? Whether you are a lift served ski resort/mountain bike park, a gorgeously landscaped historic estate turned tourist attraction, or anything in between, Trail Dynamics can help you evaluate your needs and develop your trails in a manner guaranteed to attract more visitors. As resorts are for-profit enterprises that charge a fee to trail users, risk management should be a strong consideration in resort trail development. Trail Dynamics staff has vast experience with risk management and trails and can recommend a range of proven risk management strategies to ensure that users are protected from reasonable risks unless they make an obvious, informed decision to assume those risks themselves. Many of our customers are private homeowners who are frustrated at their inability to fully utilize their land without well designed and well built sustainable trails. No matter what the size of your project, Trail Dynamics will work with you to evaluate your needs and desires and develop a trail that will allow you to access and enjoy all of the natural beauty of your property. To protect our clients privacy we prefer not to publish private individuals' names online; we will be happy to supply you with a referral list upon request.